Scientists have discovered a species of caterpillar capable of eating a common form of plastic. What lessons can nature teach us about cleaning up the nearly indestructible pollutant? Galleria mellonella caterpillars are more typically referred to as “wax worms” because they live out their larval stage as parasites in beehives, where they consume beeswax. They’re extremely widespread and represent a substantial pest to bees and beekeepers throughout Europe. Nobody had considered that the adaptation which allows these creepy-crawlies to digest beeswax might also apply to plastic, not until a chance encounter by amateur beekeeper (and full-time scientist) Federica Bertocchini. Bertocchini was disposing of the wax worms that had infested her hives by placing them in plastic shopping bags, when she began to notice that the bags quickly became riddled with holes. After closer inspection, it became clear that the holes weren’t just the result of the caterpillars attempting to chew their way to freedom. They were actually consuming the bags. 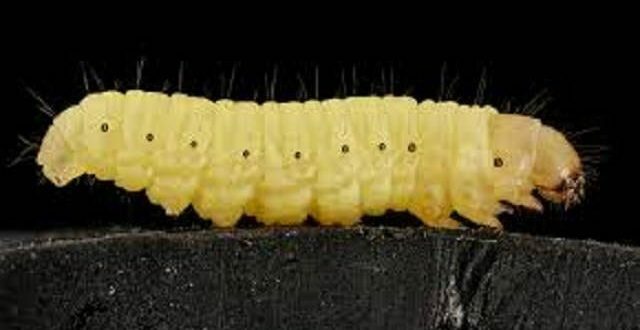 Bertocchini assembled a research team to investigate further, and found that plastic shopping bags degraded rapidly even when the caterpillars were squashed and smeared across the material, indicating that either the insects or their gut bacteria were likely producing some sort of enzyme that breaks the plastic down. The pollution problem can’t be understated. People around the world use about a trillion plastic bags every single year, and since plastic doesn’t break down very easily, all of that trash sticks around. Polyethylene now accounts for 40 percent of total demand for plastic products across Europe alone. That wax worms are capable of biodegrading plastic is likely one of nature’s happy accidents. Although researchers need further study to determine exactly how the chemistry works, they suspect that digesting beeswax and polyethylene involves breaking similar types of chemical bonds. “Wax is a polymer, a sort of ‘natural plastic,’ and has a chemical structure not dissimilar to polyethylene,” said Bertocchini.